You will earn 70 Catt credits for buying this product. 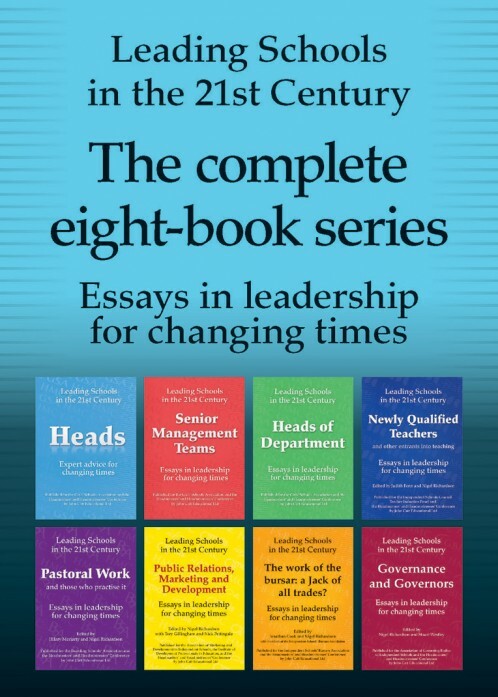 A box set of all eight books in the popular Leading Schools in the 21st Century series. Each book offers useful and informative advice on the many aspects of how to run a successful school, including how to avoid pitfalls, expect the unexpected and deal with everything from training new teachers to organising a Royal visit. Sixteen experienced Heads of GSA and HMC schools provide invaluable advice on the Early Stages; Relations with Governors, Staff and Parents; Curriculum Management and Strategy; Pastoral Care; Boarding; Finance; Development & Fundraising; Marketing; Public Relations; Appraisal. Sixteen members of HMC and GSA schools and other organisations with experience of running academic departments in schools provide invaluable advice about leading by example; monitoring the effectiveness of the department's work; leading and managing your staff; leading from the middle; the limits of autonomy; curriculum and qualifications; the HoD's role in teacher recruitment and retention; induction and training issues for new teachers; heads of science; the learning styles phenomenon: reality or hoax? ICT across the curriculum; meetings; inspection issues in the age of ISI2 and 3; what bursars do; and how to keep your bursar happy. Thirteen members of Senior Management Teams from GSA and HMC schools provide invaluable advice on the deputy head; the staffing deputy; the academic deputy/director of studies; the pastoral deputy; the senior manager in a boarding school; the role of the bursar; acting Headship; school development planning; dealing with complaints; managing bereavement in school; handling a disciplinary investigation; and managing special events. Sixteen writers with a wealth of experience provide invaluable advice on working in the independent sector; first impressions; responsibilities and rewards: advice on starting out; child protection and your protection; good classroom practice; achievement and diversity; extra and co-curricular opportunities; the effective use of time; communication with parents; role of the induction tutor; those who work around you; input and out: admissions and public exams; balances and checks; professional development issues; looking ahead: next steps. Nineteen writers with a wealth of varied experience provide invaluable advice on the social and educational context in which we work; pastoral issues and the law; pastoral strategies, teams and tactics; pastoral care of younger children; the essentials of pastoral care in prep schools; the boarding houseparents; running a girls' house in a coeducational school; from housemaster to Headmaster; pastoral care of staff; developing people and developing yourself; nursing and pastoral care; head of the sixth form; the role of the chaplain; advising on the next stage: an important pastoral issue; caring for international boarders; pastoral issues in a world of global communication; dealing with challenging teenagers. This inspiring new book focuses on the specific requirements of independent schools in the UK. Published in partnership with the HMC, the Association of Marketing and Development in Independent Schools (AMDIS), and the Institute of Development Professionals in Education (IDPE), the book has been written by experienced professionals who are experts in their field. The seventh in our popular Leading Schools in the 21st Century series. Seventeen writers provide a wealth of practical information and experience of the world of bursars. Topics include: bursars and Heads; the all-embracing nature of the job; the bursar and the bursarial team; introductory guide to child protection; policy statements and the rolling review; strategic planning, presenting accounts, finance and budgeting issues; building and maintenance; strategic planning and project management; clerk to the governors; legal issues; recruiting a bursar; the bursar in a boarding school; charities; managing ICT and its spending and getting the most out of the ISBA. The eighth and final book in our popular Leading Schools in the 21st Century series.